I'm feeling very privileged today to have been awarded Women's Economic Ventures' 2013 Santa Barbara County Volunteer of the Year at their Empowerment is Priceless breakfast. I completed WEV's Self-Employment Training (SET) in 2004, for a jewelry business I had started after being laid off three times in four years from nonprofits that kept running out of money for my positions. It was one of my classmates who, after hearing me speak for the nonprofit I had co-founded, asked if I could help her present herself better to represent her business. The light bulb went on -- coaching, training, speaking, teaching! -- and the rest is history. Everything I learned from WEV about starting my first business I then applied to my second, and 7 and a half years later I'm still here, growing and thriving, with a soft spot for working with entrepreneurs and nonprofits. And lucky for me, the majority of the volunteering I do for WEV is speaking in classrooms. 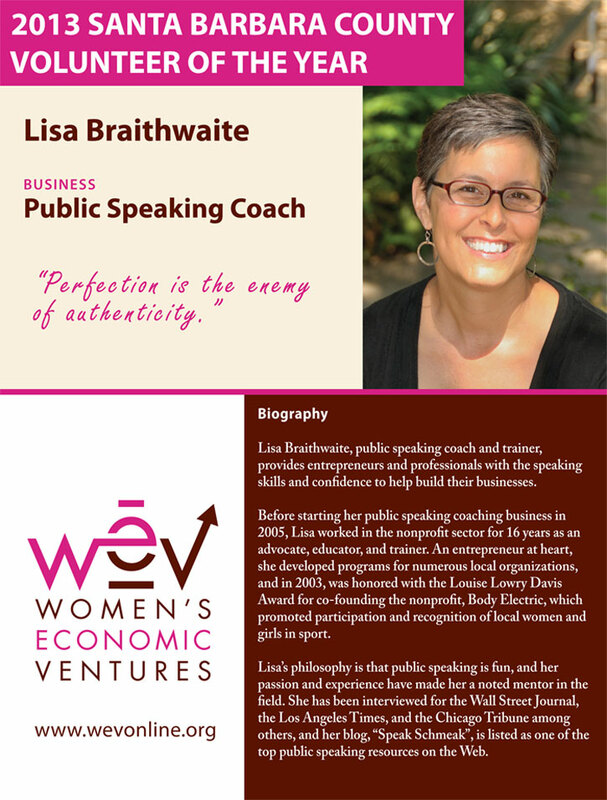 You don't have to twist my arm to get me to wax eloquent about my WEV experiences and successes, or to share my tips about business networking and using social media and speaking to grow your business. It's only my favorite thing to do. 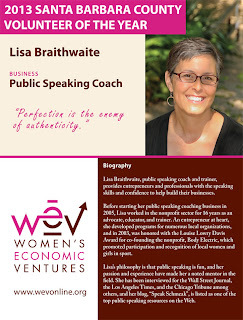 WEV is dedicated to creating an equitable and just society through the economic empowerment of women, and their programs, including SET, the Business Plan Intensive, SET to Launch, Thrive in Five, coaching, consulting and their Small Business Loan Fund, have helped thousands of women start, grow and thrive in their businesses. The WEV sisterhood is strong here in Santa Barbara (there are also men who go through the program and I'm including them in the "sisterhood"). When SET grads meet, we have an immediate connection. Even those whose business ideas turned out not to be viable still know they can always start again. We have the knowledge, the tools and the support whenever we need it. As much as getting this award makes me feel like maybe I should retire, I will keep volunteering for WEV as long as they ask me and as often as they ask me!